"Tales of a misspent youth" by Graham Whiteley: Edinburgh meeting of 7 November 2017. 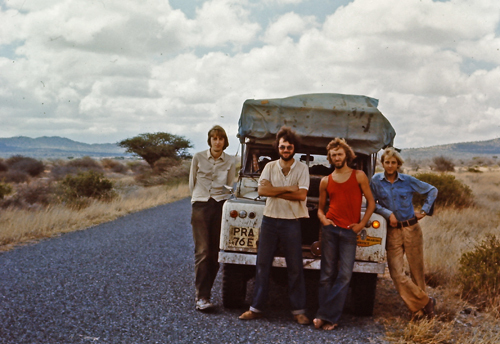 Graham Whiteley (second from left) with friends and the Land Rover after 10,000 near the Tanzania-Kenya border. Africa is big, very big, you can't believe how big. During their Landrover trip from London to Nairobi in 1974, Graham Whiteley and three friends travelled 10158 miles over 85 days (from a total journey of 127 days). The most and least miles covered on any one day being 222 and 21 miles. Their Sahara crossing covered 740 miles, and the largest country transited was Zaire, accounting for 1390 miles. Total set-up costs were £1500 (£18200 at today's prices), with a £1600 (now £19400) float of hard currency, travellers' cheques and local currencies, and total net cost after sales etc was £818 (£9100). After graduation Graham earned money for the trip by driving a Co-op milk float for nine months. Their second choice of Landrover proved up to the job, its capacity augmented by a roof rack covered with a tarpaulin, and the Continent was reached via the Ramsgate-Calais hovercraft, with a call at Toledo to replace springs that had proved unequal to the weight of their stuff. 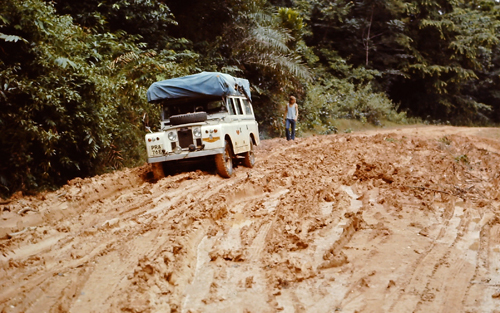 Negotiating heavy mud in Cameroon. Crossing at Oujda the frontier from Morocco to Algeria proved straightforward, and thereafter each Border was slightly different, with varying procedures and requirements. Algeria provided the first of several encounters with narrow-gauge railways thought to be now no longer operational, and sleeping under tents at oasis towns was relieved by an opportunity to overnight in the departure lounge at Ghardaia Airport. Travelling only using 1:4.000.000 scale "Carte Michelin" and without a compass, a 0430 start was made each day in the desert so as to be on the road when the sun came up, although with sudden winds on the Sahara leg they occasionally ran into drifting sand. Markets in mosque-dominated towns provided an opportunity to buy food, but meat proved less inviting when the blue layer on top turned out to be flies! Advice at the Nigerian frontier that their visas were out of date forced a three-day detour to the Niger capital Niamey for fresh ones. At Parakou they found the Dahomey Central Railway now being reportedly extended for freight to Niamey, with a station at Tchatchou worthy of a railway modeller's attention. In the then Nigerian capital Lagos the shanty towns were of better than expected quality, but the population then was 1.8m compared to over 20m now, with urban motorways already in evidence and paratransit competing with buses. An atrocious road in eastern Zaire. The impact of the Biafran war then four years previously was still apparent in south-east Nigeria. Cameroon gave way to the Central African Republic, and then to Zaire where the atmosphere was at its most threatening as a result of the Belgian colonial legacy and Katanga secession, with abandoned settler homes in evidence and a widespread dislike of photography. The discovery of a 60-cm narrow-gauge railway, originally operated with Feldbahn steam locomotives, provided an opportunity to buy diesel for the Landrover. Attempts to use the giant river ferries on the Oubangui and Zaire proved futile, mainly due to costs, and the country had to been traversed by "roads" of very variable quality. 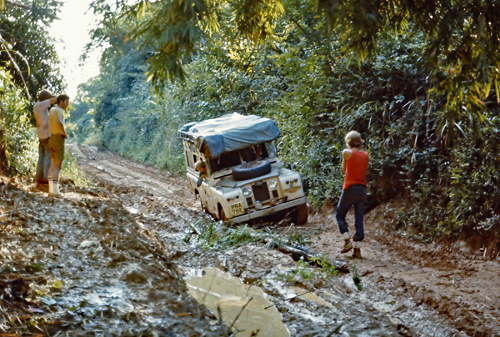 The Landrover having to be righted or eased carefully across many eroded stretches; a stay in an ex-pat French resort on Lake Kivu provided welcome relief at the of four weeks of travel arduous travel. Entering into Rwanda marked a transition to more auspicious scenery, made more poignant in the memory by the subsequent genocide, and the discovery that tea was the country's second export after coffee. Near an overnight stay in a lodge there was a view from the southern shore of Lake Victoria. Tanzania's Serengeti Plains played host to pelicans, giraffe, wildebeest and elephants, with at the Ngoragora Crater antelopes, hippos, rhino, and lions and at Arusha a sight of Mount Meru in the Kilimanjaro range. Nairobi proved a conventional modern city in which a trailer park with a friendly fast-food place next door provided a base for a couple of months during which Kenya Bus operations by the United transport Group were observed and Garrett steam locomotives seen at work on the Tsavo Plain. Christmas was celebrated on the beach at Mombasa, and with the Landrover hired to a safari operator the group went their separate ways, Graham and friend taking advantage of the close links that then extended between East Africa and India by taking one of two competing ferry operations from Mombasa to Bombay. Report by John Yellowlees. Photographs by Graham Whiteley.